Two men have been arrested in the attack. 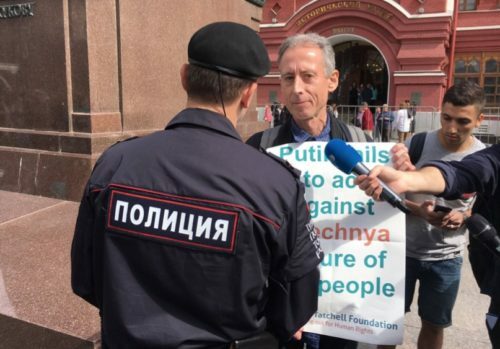 “Getting arrested is standard for Russians who protest for LGBT+ rights or against corruption, economic injustice and Russia’s annexation of Crimea and its bombing of’ civilians in Syria,” Tatchell told British outlet Gay Star News. “Little action has been taken by the Russian government and police to crack down on far right extremists who target LGBT+ people for violent and humiliating assaults – including the instigators of the current threats to bash and stab LGBT+ football fans at the World Cup,” Tatchell said. While FIFA and the Russian government made ludicrous claims that queer fans would be safe and would not be arrested for waving rainbow flags or displaying public affection under the nation’s “gay propaganda” laws, activists were quick to warn fans that the promises were bogus. Russian vigilantes have threatened to “root out and stab” LGBTQ fans and Cossacks providing security for the games have said they will report gay fans who kiss to the police.